Hawthorns Logistics Flies The Flag For Charity! 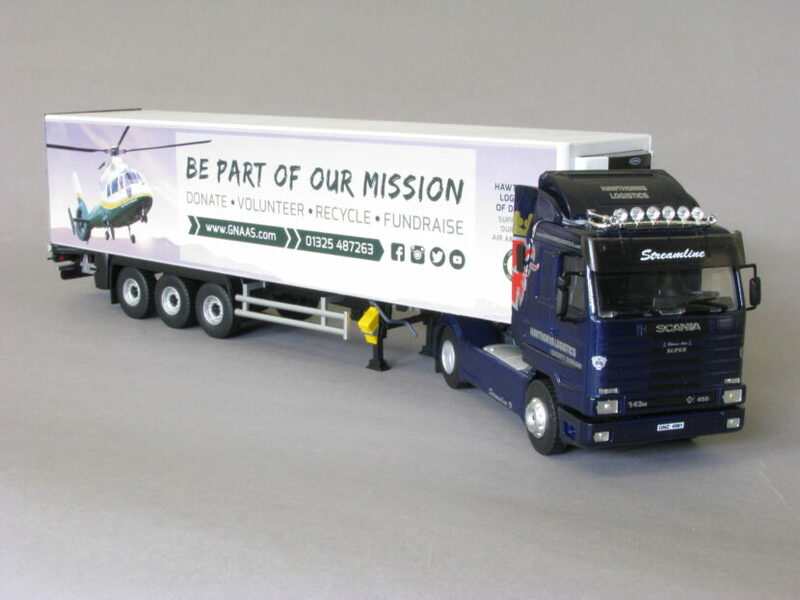 Customised promotional model vehicle specialists, Search Impex, are please to announce the release of a 1:43 scale Scania 143 (4×2) with refrigerated trailer, customised in the livery of Hawthorns Logistics and the Great North Air Ambulance. Based in Consett, Co Durham, Hawthorns Logistics is a family run Company. The owners of today’s business originally had a history of involvement in the haulage and parcel industry but, in 1988, they opted to relocate from the Birmingham area and move up to the North East, where they planned to progress into chilled distribution. After more than 20 years of working in and for other companies, the bold step was taken to set up their own business and so, in 2009, with just one employee and a truck hired in from Scania Truck Rental, Hawthorns Logistics was born. Some seven years on, through a combination of hard work, determination and dedication to customer service, Hawthorns Logistics now runs a fleet of about 30 trucks (a mix of Scania and Mercedes) with refrigerated trailers and undertakes distribution of food products throughout the UK, delivering to supermarket RDC’s 24 hours a day, seven days a week. Always keen to support a charitable cause, it seemed a fitting choice for Hawthorns Logistics to support the Great North Air Ambulance following an accident involving one of its trucks and a car. The emergency services attending the accident (which was not the fault of the Hawthorns Logistics’ driver) called for the assistance of the air ambulance in order to get the car driver to hospital as quickly as possible. Thankfully, as a result of the fast transfer to hospital and subsequent medical attention, the driver survived. As part of its support for the air ambulance, Hawthorns Logistics has undertaken a good deal of promotional work to raise awareness of the charity. 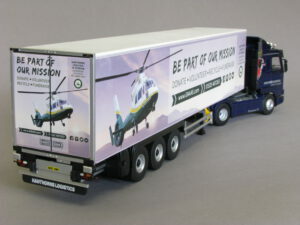 Part of the publicity has centred on a having a beautifully restored 20 year old Scania 143 coupled up with a fully liveried refrigerated trailer advertising the existence of the Great North Air Ambulance – an eye catching combination by anyone’s standards!